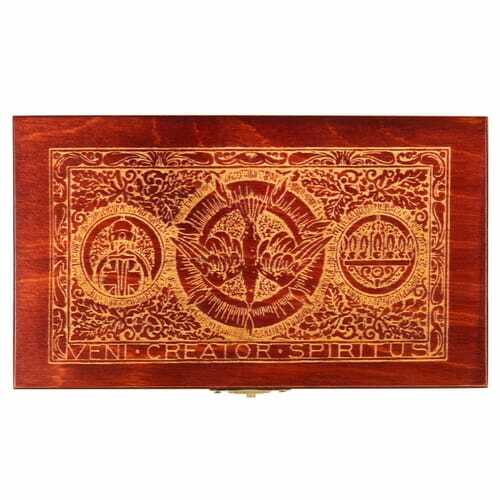 This personalized wood box has been designed especially for those receiving the Sacrament of Confirmation. Centered on the box lid is the Holy Spirit dove, the symbol associated with Confirmation. On the left is a representation of body armor to symbolize the spiritual reality received during this Sacrament of Initiation into the body of Christ. On the right is a representation of the seven gifts of the Holy Spirit as flames of fire. Surrounding the three symbols is decorative design work engraved in precise, clean lines. Along the bottom are the Latin words, Veni Creator Spiritus, which means "Come, Holy Spirit." The gift of the Holy Spirit that was first received at baptism is sealed at Confirmation, making this a great gift for teens receiving the Sacrament as well as anyone coming into the Church through RCIA. The name of your loved one will be engraved in an all-caps roman font along the front of the box. This is a fantastic, one-of-a-kind custom Confirmation gift exclusive to The Catholic Company and designed by our art department. It is a perfect way to give other gifts common to this Sacrament, such as prayer cards, patron saint medals, and rosaries. Interior has not been stained. The keepsake box looked nothing like the picture. It appeared to be cheap dull leftover wood. I'm extremely disappointed and embarrassed. I was also very disappointed in the box. The inside is raw wood, no lining. It is somewhat flimsy and the finish is dull. It would be greatly improved if they upgrade the finish and line the box. Quite honestly I am very disappointed with the box and am not going to give it to my Godson. It looked great on-line. It looks like it wasn't finished. The inside is rough and untreated wood. for $40 they could have at least put some type of finish on it or even lined it with something. I know I cannot return it because it was personalized. If you would consider returning it, I could order something else. Otherwise I will not be ordering from you again. This box is very nice quality with intricate detailing on the top. The personalization turned out nice. the clasp is strong. The inside is unpainted and unstained wood, but it is a nice size for my son to store all his prayer cards, rosaries, medals, etc. It's classy for my teenage son. Beautiful design and very good quality! I was so impressed with the quick delivery of this item, even with it being a personalized product. Gave to my granddaughter who said it was beautiful and she loved it. Thank you for making her day extra special. It is a lovely Confirmation gift but have to admit that I found it to be over-priced. It is very light-weight and flimsy to the touch. Also,I ordered some personalized lettering on the front but this can only be seen when the box is held at a certain angle. I would gladly have spent the same amount but on something else. On a good note, I have bought other items from this site and am very happy with my purchases. Received many compliments. It's truly a beautiful item! This turned out to be an incredible gift and the personalization was the perfect finishing touch. I might end up ordering a few more of these for my younger children, and saving them until their confirmations arise!